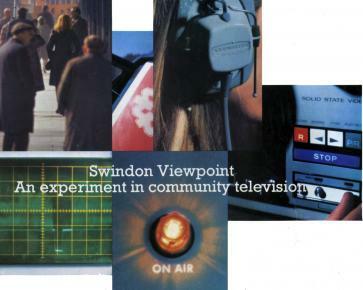 Swindon Viewpoint has a unique history in several ways; it is Britain’s original public-access television service - which started as an 'experiment' in 1973, and is also notable for being owned by and accountable to its public. You yourself are welcome and encouraged to make the programmes - and to retain editorial control as you do. Films from earlier times have also been gathered and together with recent output form a catalogue of several thousand and growing - the largest collection of films on local life of any town in the country. Viewpoint is a focal point for our visual life and times. It concentrates on what is happening now, but has done so for long enough that you can also see what we once looked like and how we have developed, what people have thought and cared about; and the diversity of lifestyles and entertainments we have known. You can use it to teach children our history, improve your own understanding, help older folk reminisce, or get up to date with events of the moment and current debates as well as join in with them. The oldest film here was made in 1913 - the most recent this week. We regularly add more and more films newly made or from the vaults and the catalogue of media we offer via our partner, Western Film Archive now stretches back across more than a century. As you would expect the range of types of programme we have carried is enormous; extending from the parochial to international significance - and from social action to arts and entertainment. Besides making these programmes, anyone can also use our blog and forum sections to raise issues and discuss and debate subjects that arise from these programmes or those that simply matter to the town. In the 21st century Viewpoint moved to being an online operation and now reaches even further, with - due to its groundbreaking history - regular viewers from around the world in various college media departments and professional media circles added to our local catchment. Statistics from late 2014 indicate regular (repeat) viewers in excess of 90,000. So if you want to make films or videos, Viewpoint gives you a large audience. Here you can also find people who will be willing to help, and also locate resources. You can seek professional advice on how to approach projects or on training. If you would like to see a programme of yours aired by the service, or need help in making such a programme please contact us. Viewpoint always aims to be open and welcoming. Here in various ways you can participate in a unique 'living diary' of local life - and that is both enjoyable and rewarding. Swindon Viewpoint is operated as a public service by Viewpoint Community Media - a Registered Charity - Number 1153153.